We fix Speed Queen washers and dryers when they need it. But they are built to last. Speed Queen builds and tests their home machines using the extensive experience they have gained with their commercial machines and the demanding conditions they must endure day in and day out for years. 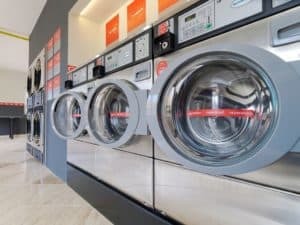 These commercial machines themselves undergo years of testing and approval so they can hold up under the most onerous of conditions in hospitals, hotels, laundramats, etc. Consequently, Speed Queen engineers and expects the washer and/or dryer you buy for your home to last a full 25 years. One reason they say this is that industrial grade appliances work better and longer because of quality parts — commercial grade metal components over plastic. Additionally, with Speed Queen, the electronic controls are hard wired for extreme climate environments, power surges, and vibration. The multi-layered circuit board has top of the line connectors and moisture-barrier backing. Commercial grade adhesive allows components to withstand years of vibration. Speed Queen offers front load washers, top load washers, stacked units, and dryers. Both top load and front load washers are built with the finest mixture of technology and reliability, and balanced to nullify noise and vibration. Washers from Speed Queen are engineered to make sure clothes get as clean as they can possibly be without damage. A flexible agitator in the top load washer ensures that water moves through clothes, and vice versa, for a thorough wash. The stainless steel wash tub is made to be gentle with linens to avoid wear and tear on fabric. Axial airflow, moisture sensing, and specialized drying cycles make Speed Queen dryers the optimal choice for speed drying and saving money on utilities. EcoCycle technology conserves energy while attaining maximum dryness. Moisture sensing cools clothes and avoids unnecessary drying, which will also extend the life of clothes. So, these are great products, built to work tirelessly and dependably for years. But sometimes something goes wrong. In that rare circumstance, C & W Appliance Repair is there to fix them for you. C & W offers advice and repairs on all your Speed Queen appliances. Call (214) 358-1496 to have one of technicians come out and fix your machine.